It was the last in a long line of successful science-fiction series that the Andersons produced as a working partnership, beginning with Supercar in the early Sixties and including the famed marionette fantasy series Stingray, Thunderbirds, Captain Scarlet, and Joe 90, as well as the gritty live-action alien-invasion drama UFO. 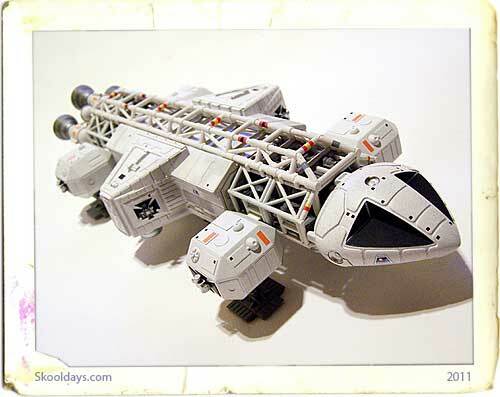 The Space 1999 Eagle Transporter is a fictional spacecraft and the iconic image of the 1970s television series. The Eagles serve as the primary spacecraft of Moonbase Alpha, which has a fleet of them. The Eagles are primarily used to explore alien planets, defend Moonbase Alpha from attack, and to transport supplies and other items to and from the Moon. Space: 1999 owes much of the visual design to pre-production work for a never-made second series of UFO which would have featured a more extensive Moonbase. It has since become a cult classic, and is available on DVD.